The Arlington Business Park is adjacent to the town of Viladecans and south west of Barcelona, approximately 12km from the City centre. 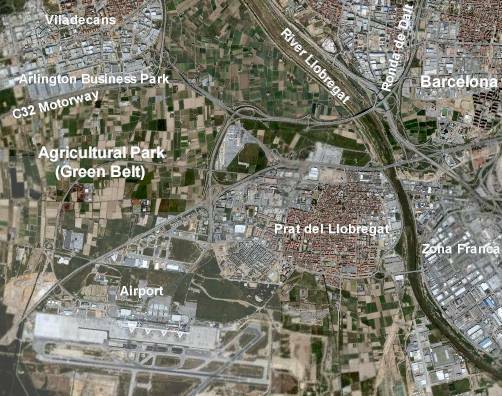 The main airport of Barcelona is approximately 5km to the south and the land is adjacent to and accessed from the C32 motorway which links Viladecans to the Ronda de Dalt (Barcelona ring road) and the City centre. The site also has access to the Viladecans Renfe train station, which adjoins the site and provides access to Barcelona's main station. The Arlington Business Park Barcelona extends to 8.612 hectares and forms part of a larger land area that has been zoned for a comprehensive development comprising residential, retail, offices, leisure and industrial accommodation, together with a substantial urban park which will be the unique focal point for the project. The Park will be accessed initially from the existing motorway junction and the new infrastructure that surrounds the site, which will be completed over the next 16 months. An additional motorway junction is programmed for completion by 2009, which will provide additional road capacity and direct access to the site. It is also anticipated that an improved direct link will be provided to the airport, which is currently being extended, reducing the road distance to approximately 2km. A new high speed rail link to the airport, the AVE, is due to be completed over the next 24 months providing high speed rail links to Madrid.